As with the rise of Syriza in Greece and the growth of Podemos in Spain, Jeremy Corbyn’s stunning win in the UK Labour Party’s leadership election is evidence that something profound is happening within European electorates. The unexpected turns in the Democratic primary indicate that a similar and related shift is happening in the United States, opening the door for significant gains for progressives after many decades of right-wing and corporate dominance. Moreover, the similarities between the United States and the United Kingdom are far greater than between the United States and either Greece or Spain. It stands to reason that if there were lessons to learn from the Greek left, then the Brits might have something to teach us, too. Corbyn’s victory represents a forceful insertion of a genuine left alternative to austerity, corporate power, xenophobia, racism, and militarism into the mainstream of British politics. By running a lively, militant, and hopeful campaign, Corbyn and the forces behind him have created the conditions necessary to build power on the left. The only reason those of us on the left in America might want to avoid imitating this result would be if we don’t actually think that Americans want a left alternative—in other words, if we don’t think we can win. Looking at Bernie Sanders’s candidacy through the mirror of Corbyn’s suggests that it is possible for the left to make a national intervention in American politics—and that what we need to do is to figure out how. 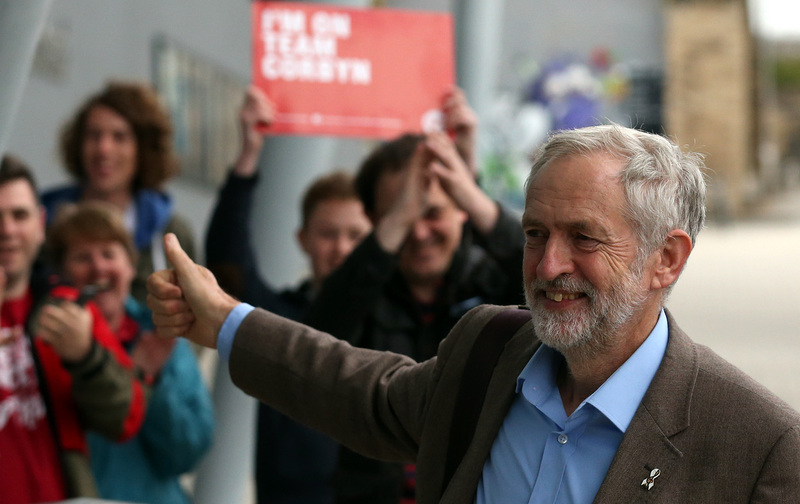 As Pablo Iglesias has said, “The left can win.” So what can we learn from the Corbynistas? 1) The messenger matters. Voters don’t necessarily hate politicians. What they hate is a class of people who for the sake of their own political advancement are content to play by the rules of a political system that manifestly fails to deliver the goods. Establishment politicians are simply not credible opponents of a system that they complacently serve. Corbyn and Sanders are both long-time elected officials, but both have always also been outsiders, without any significant power base within Labour or the Democrats. Both are forthrightly ideological in their views, and in particular both have been intransigent opponents of austerity in any guise. Both are men of modest means and modest egos. These factors matter greatly in their ability to attract support. 2) The message matters more. What led people by the hundreds of thousands to register to vote in the Labour leadership election was the combination of Corbyn’s credibility as a spokesperson for his program with his program itself. Labour voters were presented with three candidates who ranged from reactionary to milquetoast on economic policy, and one candidate who pledged open combat against austerity. Corbyn put forward a vigorously left program for ending years of economic stagnation and deteriorating public services, and people rallied to it. Sanders has also put forward an emphatically left-wing program to address the economic, political, and ecological ills facing the country, one that is many miles to the left of what any pundit or pollster thinks is acceptable to the American mainstream. Yet his poll numbers surge by the day. An alternative vision, combined with a credible spokesman for that vision, can rally mass support. 3) Changes in the rules can create openings for left forces. Corbyn’s victory would have been unimaginable under the old system, a complicated three-way electoral college that gave the party’s parliamentary delegation an outsized say in the choice of leader. But under a new, true “one-member, one-vote” system, Corbyn and his team were able to recruit supporters to register as members and pay the £3 required to vote. Their superior organizing was both galvanizing and numerically decisive. These sorts of changes come along for strange reasons and oftentimes unexpectedly. For example, the creation of a “top two” election in Chicago was the result of an effort by Republican state legislators to weaken the Democratic Party. But activists realized that it created the possibility of having a general election in which a conservative Democrat would have to face off against a progressive Democrat. The success of the United Working Families coalition in catapulting their candidate to second place in the first round enabled them to turn the runoff into a nationally covered grassroots insurgency against corporate Democrats. Left forces need to be attuned to rules changes when they happen, and look for creative ways to take advantage of them. In a broader sense, it is obvious that without major changes to the rules, it is hard for the left to win. But by the same token, support for political reform grows by the day. Sanders’s championing of a complete overhaul of how we finance elections both elevates that issue and mobilizes additional support behind his candidacy. 4) We can reject the false choice of appealing either to the “white working class” or to youth, people of color and even middle-class liberals. Labour’s constituency is not dissimilar from the Democrats’, and Corbyn won across all sections of it. The left will need to reject this false choice, because it will need support from all of those sections to win. 5) The labor movement still matters. Corbyn’s candidacy received a critical boost when he won the endorsements of several major UK unions. Now British unions have a lifelong champion of workers and the labor movement at the head of the Labour Party. Those unions had to calculate that, even if supporting Corbyn was a risky bet, it was a better choice than continuing with a policy of electability and ending up with a centrist Labour Party indifferent, at best, to the fortunes of the labor movement. American unions may not feel they can afford the same risk. But they also need to consider the risk of failing to connect with a grassroots surge that badly wants a revived labor movement. If powerful unions did choose to support Sanders, it could have a tremendous impact not just on the campaign but also on the shape of the movement after the campaign ends. 6) It takes a movement. What Corbyn’s candidacy just showed is that it is possible to rally activists from all of those constituencies if activists feel that the candidate will not just be an opportunistic ally but a real champion. The enormous enthusiasm of young people for Corbyn’s candidacy is especially significant and encouraging. As Richard Seymour has lucidly written, there are going to be hard fights ahead for Corbyn and his supporters, not just with their opponents but also among themselves. But the existence of a shared, public, national project—first electing Corbyn, now making him successful as leader—creates space for coalitions to solidify and for power to be built. I think Sanders’s campaign presents a similar opportunity. Sanders is a champion on nearly all of the issues that have mobilized large numbers of Americans, including inequality, climate change, immigrants’ and workers’ rights, college tuition and student debt, and racial justice—even if he has considerable and important work to do to convince people of color that he will combat structural racism directly. His platform is radical and represents a real alternative to both the brutality of the Republicans and the complacency of mainstream Democrats. He rejects Super PACs and every other electoral perversion and pledges to thoroughly reform the electoral process. He is trying to speak to everyone who wants to break with the status quo. And Sanders recognizes that even if he gets elected, no part of his program will become law unless a powerful movement is publicly demanding it. Corbyn’s campaign and now his victory have energized left forces in Britain to mount a serious fight for radical change. The incredible enthusiasm for Sanders suggests that the support that left forces in America need to mount our own fight is out there. But we have to figure out how to give it form. I am not arguing that progressives simply drop everything and try to elect Bernie Sanders. What I am arguing is that his campaign represents the best opportunity I have seen for left forces to make a major intervention in national politics in decades, and therefore we should be thinking about how to use it to make the most forceful intervention possible. Corbyn’s victory suggests that the better Sanders does, the more people will believe that a serious fight is worth the effort. At the very least, the fact of Sanders’s success so far suggests that a serious debate is needed about we might make such an intervention. Corbyn’s victory has laid the groundwork for the emergence of a new political force capable of exerting a profound influence on the direction of British politics and policy. To use a much-overused phrase, it has sent “shockwaves” through Britain. No one can predict what will happen. But when the situation is unpredictable, isn’t it better to be the one taking the initiative, than the one reacting to events as they unfold? We on the left have become very unaccustomed to producing the shockwaves. Now seems like a promising time for that to change.